Irish Seams is the source for all of your Irish Dance needs. Worry not! Our team has years of Irish dance experience. We’ll help you find just the right thing, be it a toe-saving cushion or the newest bling fashions. And what’s more, we won’t push you to buy things you don’t need; we want you to be happy with your purchase, so we’ll make sure it’s the right product for you, every time. Irish Seams is the official dressmaker for several of our local (and not so local) Irish dance schools. We’d be happy to talk to you about outfitting your school, team, or troupe. Email info@irishseams.com for more information or to schedule a meeting, phone call, or video chat. Irish Seams offers a wide range of alteration services for school dresses, solo dresses, vests, and pants. We work with you to get the perfect fit! We can also check a dress you’re planning to buy for alterability, so you can buy with confidence that your new dress can be altered to fit you. Sometimes a beloved solo dress needs a little modern “umph!” A new skirt or sleeves can make and old dress feel like new again, and we at Irish Seams are excited to help shape your old dress to fit your new vision. Other options include adding ruffles or layers to skirts, new cuffs, collars, or shawls, and applique patches to update the design. And of course, we can always use our Swarovski rhinestones to emphasize existing designs or create new ones – when in doubt, bling it out! Coming soon! We’re excited to launch our new line of solo designs, with styles to fit all budgets and levels. We also offer custom solo dress and vest designs, allowing you to work with our design team for the perfect look and fit. At Irish Seams, we know feis aren’t all you do, so they’re not all we do either! We offer a range of costumes designed for flair and flexibility, including skirts, tops, and full dresses customized to your style. 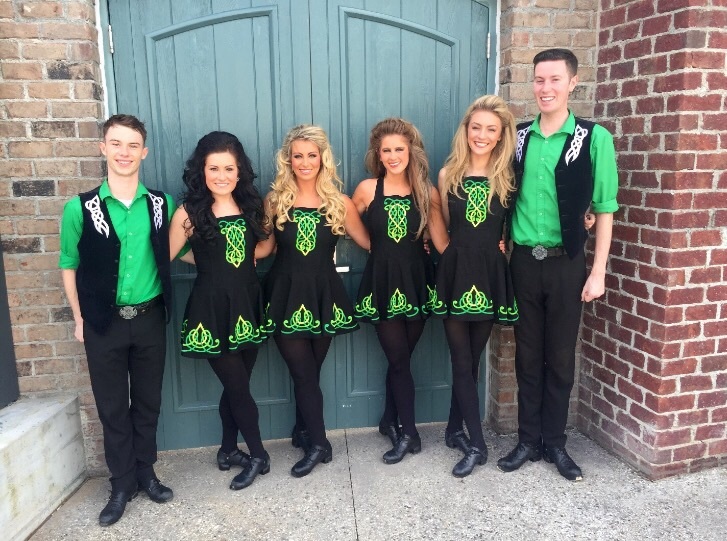 Raglan Road dancers in downtown Disney, dresses by Irish Seams. We offer both individual and school spirit wear, including discounted rates for bulk orders and school contracts. We carry track suits in both women’s fit and unisex styles and can add embroidered, vinyl, or rhinestone designs. Jackets include a full-sized logo on the back with an individualized name on the front; custom additions such as sleeve designs are also available. School t-shirts, tanks, shorts, sweatshirts, and sweatpants and other gear are also available; contact spiritwear@irishseams.com for more info! We are available to vend at feiseanna! We can bring our full range of products – everything from shoes, wigs, and socks to t-shirts and gift items. From our home base in Rockville, Maryland, we can travel as far west as Ohio and Kentucky, north to New York, and south to Georgia, and we are looking to expand our range. The same holds for school visits: we can come to your school for dress fittings, fundraisers, ceilis, school feis, or anything else you may have planned. Contact vending@irishseams.com for more information.